Lorenzo Pasqualis, the Blog: Automatic Art, drawing without knowing. 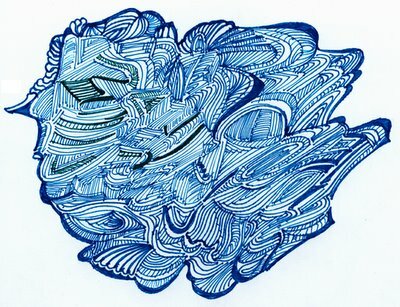 Automatic Art, drawing without knowing. When I am listening carefully at something important and I am very absorbed in the subject but, at the same time, the subject or the situation doesn't require for me to look or do anything in particular, I tend to start drawing stuff on whatever piece of paper is in front of me. You probably have done that a million times when you are on the phone and you have paper and pencil handy. For me these drawings usually start from the center and usually end up being geometric compositions formed by lines and curves disposed in intricate patterns. The longer the concentration period lasts, the bigger the drawing gets. In lack of a better name I call this "Automatic Art" or "Telephone Art". While I'm doing it I don't really pay any attention to it. It kind of just happen and it's completly driven by my [crazy] subconscious. This is similar to when you drive but you don't realize that you are doing so, and when you look back you can't remember the moment that you drove past certain spots you know were on your path.